ok, I have a question/issue about stock, which I hardly ever make: it always seems almost immoral to me to take all those lovely veg and let them stew, then throw them away. Or do you have another way to use them afterwards? I always think “why not just put more veg in the soup and assume that you have the flavours you need, plus not ‘waste’ any beautiful fresh veggies?” I know that real chefs will say that the stock gives great flavour to all sorts of dishes, but I just can’t bring myself to do it. 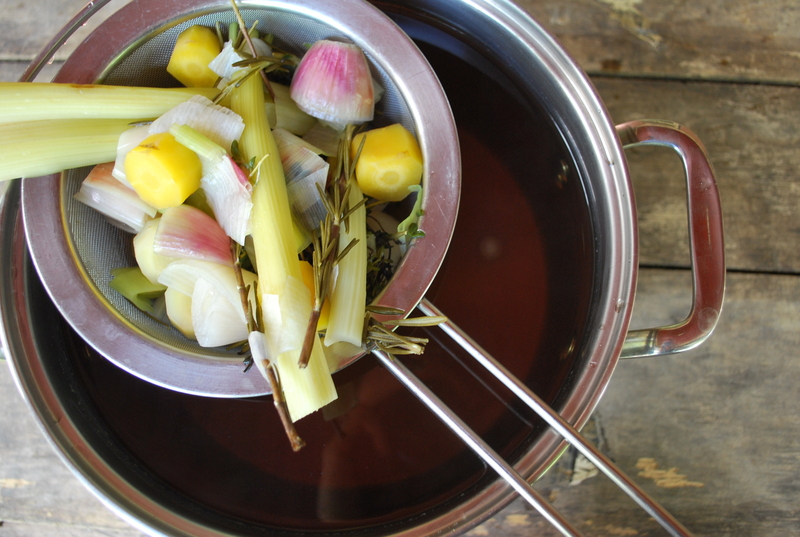 In fact, I realize that I only think of making stock with bones (from organically-raised animals) (NOT very vegan!). I totally appreciate where you’re coming from but do I have a solution (or partial solution) for you!! Andrew and I have started saving veggie-off-cuts, like the tops of fennel, and the outer most parts of leeks, etc. We just have a “stock bag” going in the freezer and add things to it as we go along. This doesn’t completely address your dilemma – you may still need to add a few carrots, more decent onion etc. but it’s worth it. Honestly! Stock is powerful. Subtle. Yummy. Medicinal. Also, with veggie stock you don’t need to stew the life out of the vegetables – even a 15 minute simmer will do so you could bag, freeze, and reuse your veggies. Just curious about the measurements of vegetables for the stock… I’m clearly not much of a math whiz, but 3 and 4 oz doesn’t seem like very much veg for 3 quarts of water… can you tell me appx. how many carrots, celery stalks and bulbs of fennel that would translate to? With thanks, LOVE this site! Thank you for this and I take your point. I copied this recipe from Michael Potters, as noted, but I think I can improve on it and, besides which, I’ve kind of made it my own anyway. Tomorrow I’m going to update it but for now, I would suggest 12 cups water, 2 onions, 6 medium carrots, 4 celery stalks, 4 leeks, 2 small fennel bulbs, 8 cloves of garlic. The rest I think is the same. I don’t add wine but you can, or you can experiment with half to see what you like. I make a HUGE batch and freeze it in different sized containers for soups, sautes, risotto, basically everything. And thanks for the shout-out. I’m so glad you love the site. I love hearing that you love the site. One more thing about the measurements. There’s a whole chef thing about using weight-based measurements instead of volumetric ones. I get it. The weight-based measurements are more accurate and consistent. BUT, most of us aren’t set up that way with scales in our kitchen and a calculator on hand to translate cookbooks. v:gourmet is into accessibility – it’s got to be easy for people, and enjoyable, and stress-free. So I really appreciate your question to remind me to ensure all my recipes are as straightforward as possible. I’ve made the necessary changes above and will be cheering you on in your stock-making pursuits. Enjoy, but beware, it can become addictive!